Owlet is a standalone, unbiased, physically-based raytracing renderer. It loads 3D models in many common formats, allows you to compose the scene and setup materials, and then renders resulting images using our state-of-the-art raytracing engine. Owlet provides a sophisticated materials system with support of multi-layer reflection, refraction, subsurface scattering, absorbtion, thin-film interference, image-based lighting and much more. At the other hand, Owlet comes with a growing library of 150+ ready-to-use materials and textures, so you don't have to start from scratch. Realistic 3D Mockups Made Easy. Boxshot features 50+ customizable shapes and renders them so realistically that customers may think they are seeing a photo of the actual product. 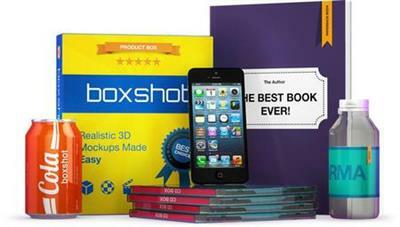 Boxshot features a large selection of customizable shapes: software boxes; hardbound and paperback books; magazines; CD, DVD, and Blu-ray boxes; cards, cans, mugs; bags; and much more. Almost all the shapes are customizable so you can adjust them for your design. Realistic 3D Mockups Made Easy. Boxshot features 50+ customizable shapes and renders them so realistically that customers may think they are seeing a photo of the actual product.